Big Sur is a 100-mile stretch of ruggedly beautiful seacoast along the Pacific Ocean in west-central California; an area known worldwide for its beauty. Its natural grandeur has long drawn people to the area; yet, isolated by the steep coastal mountain range and rugged coastline, Big Sur remains sparsely populated. In addition to spectacular ocean views, the area is home to oak and lush redwood forests, rocky streams, and coastal brush. 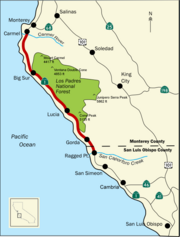 Big Sur's boundaries are loosely defined; many definitions of the area include the 90 miles of coastline between the Carmel River and San Carpoforo Creek, while some sources extend the southern end an additional 10 miles to San Simeon. While many sources extend the area 20 miles inland to the eastern foothills of the Santa Lucias, other sources limit the eastern border to the coastal flanks of these mountains, only three to 12 miles inland. Big Sur's Cone Peak is the highest coastal mountain in the lower 48 states, ascending nearly a mile (5,155 feet/1.6 km) above sea level, only three miles (4.8 km) from the ocean. The inhabitants of Big Sur have been proactive in installing measures to protect, preserve, and restore the wilderness qualities and biodiversity of the region. Ohlone dancers at Mission San José. Three tribes of Native Americans—the Ohlone, Esselen, and Salinan—were the first inhabitants of the area now known as Big Sur. Archaeological evidence shows that they lived in the area for thousands of years, leading a nomadic, hunter-gatherer existence. Few traces of their material culture have survived. Their arrow heads were made of obsidian and flint, which indicates trading links with tribes hundreds of miles away, since the nearest sources of these rocks are in the Sierra Nevada mountains and the northern California Coast Ranges. These early tribes followed local food sources seasonally, living near the coast in winter to harvest rich stocks of mussels, abalone and other sea life, and moving inland at other times to harvest oak acorns. Bedrock mortars—large exposed rocks hollowed out into bowl shapes to grind the acorns into flour—can be found throughout Big Sur. The tribes also used controlled burning techniques to increase tree growth and food production. The first Europeans to see Big Sur were Spanish mariners led by Juan Cabrillo in 1542, who sailed up the coast without landing. Two centuries passed before Spain attempted to colonize the area. In 1769, an expedition led by Gaspar de Portolà was the first Europeans known to set foot in Big Sur, in the far south near San Carpoforo Canyon. Daunted by the sheer cliffs, his party avoided the area and pressed far inland. Portolà landed in Monterey Bay in 1770, and with Father Junìpero Serra, who helped found the majority of the missions in California, established the town of Monterey, which became the capital of the Spanish colony, Alta California. The Spanish gave Big Sur its name during this period, calling the region el país grande del sur ("the Big Country of the South") which was often shortened to el sur grande, because it was a vast, unexplored, and impenetrable land south of their capital at Monterey. 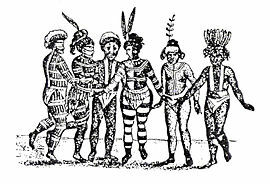 The Spanish colonization devastated the Native population, which perished from European diseases or forced labor and malnutrition at the missions in the eighteenth century, while many remaining members assimilated with Spanish and Mexican ranchers in the nineteenth century. Along with the rest of California, Big Sur became part of Mexico when it gained independence from Spain in 1821. In 1834, the Mexican governor, José Figueroa, granted a 9,000 acre (36 km²) rancho in northern Big Sur to Juan Bautista Alvarado. His uncle by marriage, Captain J.B.R Cooper, assumed ownership soon afterwards. The oldest surviving structure in Big Sur, the so-called Cooper Cabin, was built in 1861, on the Cooper ranch. In 1848, as a result of the Mexican-American War, Mexico ceded California to the United States. After passage of the federal Homestead Act in 1862, a few hardy pioneers moved into Big Sur, drawn by the promise of free 160 acre (0.6 km²) parcels. Many local sites are named after the settlers from this period: Gamboa, Pfeiffer, Post, Partington, Ross, and McWay are common place names. Consistent with the Anglo-Hispanic heritage of the area, the new settlers mixed English and Spanish and began to call their new home "Big Sur." From the 1860s through the turn of the twentieth century, lumbering cut down most of the coast redwoods. Along with industries based on tanoak bark harvesting, gold mining, and limestone processing, the local economy provided jobs and supported a large population. In the 1880s, a gold rush boom town, Manchester, sprang up at Alder Creek in the far south. The town boasted a population of 200, four stores, a restaurant, five saloons, a dance hall, and a hotel, but was abandoned soon after the turn of the century. The remains of the abandoned town burned to the ground in 1909. There were no reliable roads to supply the emerging industries, so local entrepreneurs built small boat landings at a few coves along the coast, such as Bixby Landing. None of these landings remain today, and few other signs of this brief industrial period are visible to the casual traveler. The rugged, isolated terrain kept out all but the sturdiest and most self-sufficient settlers. A 30 mile (50 km) trip to Monterey could take three days by wagon, over a rough and dangerous track. After the industrial boom faded, the early decades of the twentieth century passed with little change, and Big Sur remained a nearly inaccessible wilderness. As late as the 1920s, only two homes in the entire region had electricity, generated locally by water wheels and windmills. Most of the population lived without power until connections to the California electric grid were established in the early 1950s. Big Sur changed rapidly when Highway 1 was completed in 1937, after eighteen years of construction, aided by New Deal funds and the use of convict labor. Highway 1 dramatically altered the local economy and brought the outside world much closer, with ranches and farms quickly giving way to tourist venues and second homes. Even with these modernizations, Big Sur was spared the worst excesses of development, due largely to residents who fought to preserve the land. The Monterey County government won a landmark court case in 1962, affirming its right to ban billboards and other visual distractions on Highway 1. The county then adopted one of the country's most stringent land use plans, prohibiting any new construction within sight of the highway. Big Sur coast about 12 miles south of Monterey. Rocky Creek Bridge is visible in the middle distance. In the early to mid-twentieth century, Big Sur's relative isolation and natural beauty began to attract a different kind of pioneer—writers and artists, including Robinson Jeffers, Henry Miller, Edward Weston, Richard Brautigan, Hunter S. Thompson, and Jack Kerouac. Jeffers was among the first of these. Beginning in the 1920s, his poetry introduced the romantic idea of Big Sur's wild, untamed spaces to a national audience, which encouraged many of the later visitors. Henry Miller lived in Big Sur from 1944 to 1962. His 1957 novel, Big Sur and the Oranges of Hieronymus Bosch, described the joys and hardships that came from escaping the "air conditioned nightmare" of modern life. The Henry Miller Memorial Library, a cultural center devoted to Miller's life and work, is a popular attraction for many tourists. Hunter S. Thompson worked as a security guard and caretaker at Big Sur Hot Springs for eight months in 1961, just before it became the Esalen Institute. While there, he published his first magazine feature in the nationally distributed Rogue Magazine, about Big Sur's artisan and bohemian culture. Jack Kerouac spent a summer in Big Sur in the early 1960s, and wrote a novel titled Big Sur based on his experience there. The area's increasing popularity and cinematic beauty soon brought the attention of Hollywood. Orson Welles and his wife, Rita Hayworth, bought a Big Sur cabin on impulse during a trip down the coast in 1944. They never spent a single night there, and the property is now the location of a popular restaurant. Elizabeth Taylor and Richard Burton starred in the 1965 film, The Sandpiper, featuring many location shots of Big Sur, and a dance party scene on a soundstage built to resemble the same restaurant. The Sandpiper was one of the very few major studio motion pictures ever filmed in Big Sur, and perhaps the only one to use actual Big Sur locales as part of the plot. The DVD, released in 2006, includes a Burton-narrated short film about Big Sur, quoting Robinson Jeffers poetry. Another film based in Big Sur was the 1974 Zandy's Bride, starring Gene Hackman and Liv Ullman. An adaptation of The Stranger in Big Sur by Lillian Bos Ross, the film portrayed the 1870s life of the Ross family and their Big Sur neighbors. Big Sur also became home to centers of study and contemplation—a Catholic monastery, the New Camaldoli Hermitage in 1958, the Esalen Institute, a workshop and retreat center in 1962, and the Tassajara Zen Mountain Center, a Buddhist monastery, in 1966. Esalen hosted many figures of the nascent "New Age," and in the 1960s, played an important role in popularizing Eastern philosophies, the "human potential movement," and Gestalt therapy in the United States. Big Sur remains sparsely populated, with about 1,000 inhabitants, according to the 2000 U.S. Census. The people of Big Sur today are a diverse mix: Descendants of the original settler and rancher families, artists and other creative types, along with wealthy home-owners from the worlds of entertainment and commerce. There are no urban areas, although three small clusters of gas stations, restaurants, and motels are often marked on maps as "towns:" Big Sur, in the Big Sur River valley, Lucia, near Limekiln State park, and Gorda, on the southern coast. The economy is almost completely based on tourism. Much of the land along the coast is privately owned or has been donated to the state park system, while the vast Los Padres National Forest and Fort Hunter Liggett Military Reservation encompass most of the inland areas. The mountainous terrain, environmentally conscious residents, and lack of property available for development have kept Big Sur almost unspoiled, and it retains an isolated, frontier mystique. Pictures taken on afternoons in June (upper) and December (lower). The summer picture shows a typical fog bank nearly 1,000 feet (300 m) thick. 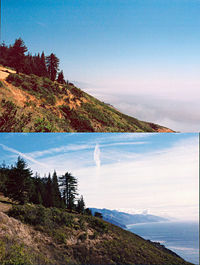 It is not easy to generalize about the weather in Big Sur, because the jagged topography causes many separate microclimates. This is one of the few places on Earth where redwoods grow within sight of cacti. Still, Big Sur typically enjoys a mild climate year-round, with a sunny, dry summer and fall, and a cool, wet winter. Coastal temperatures vary little during the year, ranging from the 50s at night to the 70s by day (Fahrenheit) from June through October, and in the 40s to 60s from November through May. Farther inland, away from the ocean's moderating influence, temperatures are much more variable. January is the coolest month while August is usually the warmest month. Average annual precipitation at the state park headquarters is 41.94 inches, with measurable precipitation falling on an average of 62 days each year. In excess of 70 percent of the rain falls from December through March, while the summer brings drought conditions. Measurable snowfall has not been recorded in coastal Big Sur, but is common in the winter months on the higher ridges of the Santa Lucia Mountains. The abundant winter rains cause rock and mudslides that can cut off portions of Highway 1 for days or weeks, but the road is usually quickly repaired. Along with much of the central and northern California coast, Big Sur often has dense fog in summer. The summer fog and drought have the same underlying cause: A massive, stable seasonal high pressure system that forms over the north Pacific Ocean. The high pressure cell inhibits rainfall and generates northwesterly airflows. These prevailing summer winds from the northwest push the warm ocean surface water to the southeast, away from the coast, and frigid deep ocean water rises in its place. The water vapor in the air contacting this cold water condenses into fog. The fog usually moves out to sea during the day and closes in at night, but sometimes heavy fog blankets the coast all day. Fog is an essential summer water source for many Big Sur coastal plants. Most plants cannot take water directly out of the air, but the condensation on leaf surfaces slowly precipitates into the ground like rain. The many climates of Big Sur result in an astonishing biodiversity, including many rare and endangered species such as the wild orchid Piperia yadonii. Arid, dusty chaparral-covered hills exist within easy walking distance of lush riparian woodland. The mountains trap most of the moisture out of the clouds; fog in summer, rain and snow in winter. This creates a favorable environment for coniferous forests, including the southernmost habitat of the coast redwood (Sequoia sempervirens), which grows only on lower coastal slopes that are routinely fogged in at night. The redwoods are aggressive regenerators, and have grown back extensively since logging ceased in the early twentieth century. The rare Santa Lucia fir (Abies bracteata), as its name suggests, is found only in the Santa Lucia mountains. A common "foreign" species is the Monterey pine (Pinus radiata), which was uncommon in Big Sur until the late nineteenth century, when many homeowners began to plant it as a windbreak. There are many broad leaved trees as well, such as the tanoak (Lithocarpus densiflorus), coast live oak (Quercus agrifolia), and California Bay Laurel (Umbellularia californica). In the rain shadow, the forests disappear and the vegetation becomes open oak woodland, then transitions into the more familiar fire-tolerant California chaparral scrub. Although some Big Sur residents catered to adventurous travelers in the early twentieth century, the modern tourist economy began when Highway 1 opened the region to automobiles, and only took off after World War II-era gasoline rationing ended in the mid-1940s. Most of the 3 million tourists who visit Big Sur each year never leave Highway 1, because the adjacent Santa Lucia mountain range is one of the largest roadless areas near a coast in the lower 48 states. The highway winds along the western flank of the mountains mostly within sight of the Pacific Ocean, varying from near sea level up to a thousand-foot sheer drop to the water. Because gazing at the views while driving is inadvisable, the highway features many strategically placed vista points allowing motorists to stop and admire the landscape. The section of Highway 1 running through Big Sur is widely considered as one of the most scenic driving routes in the United States, if not the world. The land use restrictions that preserve Big Sur's natural beauty also mean that tourist accommodations are limited, often expensive, and fill up quickly during the busy summer season. There are fewer than 300 hotel rooms on the entire 100 mile (160 km) stretch of Highway 1 between San Simeon and Carmel, only three gas stations, and no chain hotels, supermarkets, or fast-food outlets. The lodging options are rustic cabins, motels, and campgrounds, or costly, exclusive five-star resorts, with little in between. Most lodging and restaurants are clustered in the Big Sur River valley, where Highway 1 leaves the coast for a few miles and winds into a redwood forest, protected from the chill ocean breezes and summer fog. Besides sightseeing from the highway, Big Sur offers hiking, mountain climbing, and other outdoor activities. There are a few small, scenic beaches that are popular for walking, but usually unsuitable for swimming because of unpredictable currents and frigid temperatures. Big Sur's nine state parks have many points of interest, including one of the few waterfalls on the Pacific Coast that plunges directly into the ocean, the ruins of a grand stone cliffside house that was the region's first electrified dwelling, and the only complete nineteenth century lighthouse complex open to the public in California, set on a lonely, windswept hill that looks like an island in the fog. Big Sur viewed from summit of Cone Peak. Looking west from Nacimiento-Ferguson Road. Fog comes in off the Pacific on a typical June day. Big Sur Coast looking south. The author Henry Miller lived in Big Sur from 1944-1962. McWay Cove and falls in Julia Pfeiffer Burns State Park. Coastline with the McWay Rocks in foreground. Hurricane Point looking north. 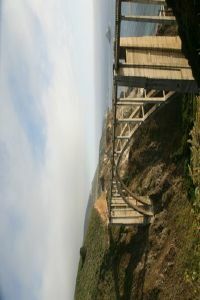 Bixby Bridge is visible in the middle distance. Sunset over Big Sur on the north-western edge of Andrew Molera State Park. View of the coastline from Lucia. Coastline 20 miles (30 km) south of Carmel. ↑ Paul Henson and Donald Usner, The Natural History of Big Sur (Berkley, CA: University of California Press, 1993). ↑ Analise Elliott, Hiking & Backpacking Big Sur (Berkley, CA: Wilderness Press). ↑ Henson and Usner, p. 269-270. ↑ Kathleen E. Davis, Big Sur Cabin, California Department of Parks & Recreation. Retrieved May 8, 2008. ↑ John Woolfenden, Big Sur: A Battle for the Wilderness 1869-1981 (Pacific Grove, CA: The Boxwood Press, 1981), p. 72. ↑ Rosalind Sharpe Wall, A Wild Coast and Lonely: Big Sur Pioneers (San Carlos, CA: Wide World Publishing, 1989), p. 126-130. ↑ Henson and Usner, p. 328. ↑ National Advertising Co. v. County of Monterey, 211 Cal.App.2d 375, 1962. ↑ Monterey County Film Commission, Films Shot in Monterey County. Retrieved May 8, 2008. ↑ Western Regional Climate Center, Historical Climate Information. Retrieved May 8, 2008. ↑ Henson and Usner, p. 33-35. ↑ Big Sur Chamber of Commerce, Lodging Guide to Big Sur. Retrieved May 8, 2008. All links retrieved June 7, 2016. A Short History of Big Sur From the Big Sur Chamber of Commerce. A Guide to California's Big Sur: A comprehensive visitor's guide to the Big Sur region. Henry Miller Memorial Library in Big Sur. Ventana Wilderness Alliance: Wilderness conservation and hiking trails info in the Big Sur area. Google Map of Big Sur. Esselen Tribe Website Esselen Tribe of Monterey County. This page was last modified on 7 June 2016, at 16:17.